A great position to enter the Dita hockey stick range review is with the Terra 20. This mid-range stick is ideal for players with an intermediate skill level who are looking to start to get used to a really low bow stick. One of the longest established brands in the industry, Dita have been making sticks for coming up 125 years. Despite this I don’t get to see enough of them on UK hockey sites. Providing reviews as we do I was very excited to see a lovely looking new Dita Terra 20 a couple of weeks ago and it’s owner agreed to let me get information for my review. Dita certainly do things slightly different to other brands and the Terra 20 continues this tradition. Playing with the stick the thing that is obvious, is how low the bow is on the shaft of the Dita Terra 20. I wish I had measured it at the time (although it’s always a little weird when I do that) so I could share exactly how low the bow on the Dita Terra 20 actually is. Unfortunately, as Dita don’t publish the exact position I have to take a guess based on experience of other sticks. At a push I would say the Dita shaft bow position is around the 220mm up from the ground mark. Once I checked out more about this stick online in order to make the review of the Dita Terra 20, I was excited to find a relatively low priced stick with such a low bow. This gives you a chance to really develop the skills needed to fire of a super drag-flick from penalty corners, without breaking the bank. Despite the low bow the Dita Terra 20 seems to balance very nicely and is light enough to maneuver comfortably so you can control the ball well. After playing with the stick for a while it also confused me when I came back and read that the carbon content in the Dita Terra 20 is listed as 30%, it seemed stiffer and harder hitting than this number would suggest. Another thing that stood out to me was how well I could bring a fast hit pass under control with a straight stick. I can review that the Dita Terra 20 has a really nice touch on the ball and the low position of the bow stops that rising up the shaft you can get when the ball comes in fast. The coolest bit of technology on the Dita Terra 20 has to be the face of the head. There is a distinct abrasive layer on the face that offers room behind the ball to dissipate water and grips the ball giving more control when dribbling and in particular turning with the ball. For my review of the Dita Terra 20 I just want to tell you that the head is described by Dita and the retailers as “J-Shape” is just the same as a Maxi head on all the other brands sticks. It’s a good size and is definitely designed to give maximum areas of contact with the ball. Frustratingly there is very little decent, or comparable information about the Dita Terra 20 available that I can pass on to you, I have included some key stats below from the information I can gather. However, if you are looking for a review of the Dita Terra 20 hockey stick before you purchase one, I should tell you this. Considering the information available, particularly the surprisingly low carbon content, the Dita Terra 20 plays really nicely. The Dita Terra 20 strikes the ball quite firmly, enough for anyone who can put a bit of effort in to it, although if you are after power it probably isn’t right. If you are reviewing sticks that can give you a really low bow for a fair price however, the Dita Terra 20 could just fit that bill. For me the best price I’ve seen for the Dita Terra 20 does make me believe there are better sticks you could buy to get the same job. 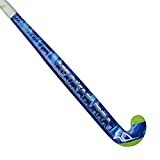 The Kookaburra Stinger hockey stick review my colleague has written offers a better option. Though in this fantastic world of hockey we are part of, you can get attached to brands and if you are attached to Dita, the Terra 20 offers a great option to try or to progress your skills, particularly in drag-flicking. The 2015 model of the Dita Terra 20 has a grey/silver with black design. Most UK stockists only have 36.5” versions as far as I can see, in the US you should be able to find the longer 37.5” version.